Preheat oven to 350º F. Prepare cake pan(s) by spraying with no-stick cooking spray. Blend cake mix, water, oil, and eggs in a large mixing bowl until moistened. Using a mixer, beat on medium speed for two minutes. Pour batter into prepared pan(s). Bake for 29-35 minutes (see package for specific times for each pan size). Cool cake completely. Crumble cooled cake into a large mixing bowl. Add ¼ cup frosting and mix until well combined. Scoop mixture out by the tablespoonful. I use a small ice cream scoop to make easy work of this task. Roll each scoop into a ball. Drain maraschino cherries and pat dry with paper towels. Press one cherry into the center of each cake ball. Bring the cake mixture up and around the cherry. Roll in between your two hands to form a nice ball. Melt and temper semi-sweet chocolate or melt confectionery coating/candy melts. 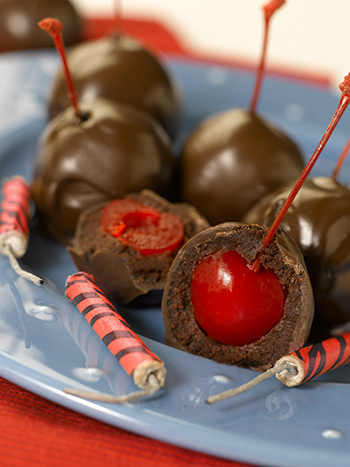 Dip cake covered cherries in chocolate. Set on a parchment paper lined baking sheet. Refrigerate until set, about 5 minutes. Bring to room temperature before serving.